Can you feel the excitement?! It's our first birthday and we've got a great party lined up for you! It has been such a fun experience to have a small part in the rise of this company. Lesley (our fearless leader and captain of all things Heffy Doodle) is one of the sweetest and most adorable people I know, and I am just so tickled to see all the good things that have come her way as a result of her hard work. You can't have a birthday party without a birthday card, am I right?! So today's card is all about birthdays. Confession: I am about to lose my mind with how many scraps of cardstock I have lying about in my craft room! So I was determined to put those to good use! You don't have to waste any of your scraps if you don't want to, and here's a great way to recycle them. I cut up a bunch of my cardstock scraps into thin strips. I glued and placed them on to a trimmed cardstock panel (4 x 5.25 inches). I laid them on a diagonal angle so I could hide the fact that I'm not the best at making any straight lines! After I was done creating the background, I cut out two different scallop pieces using a Lawn Fawn scallop die. 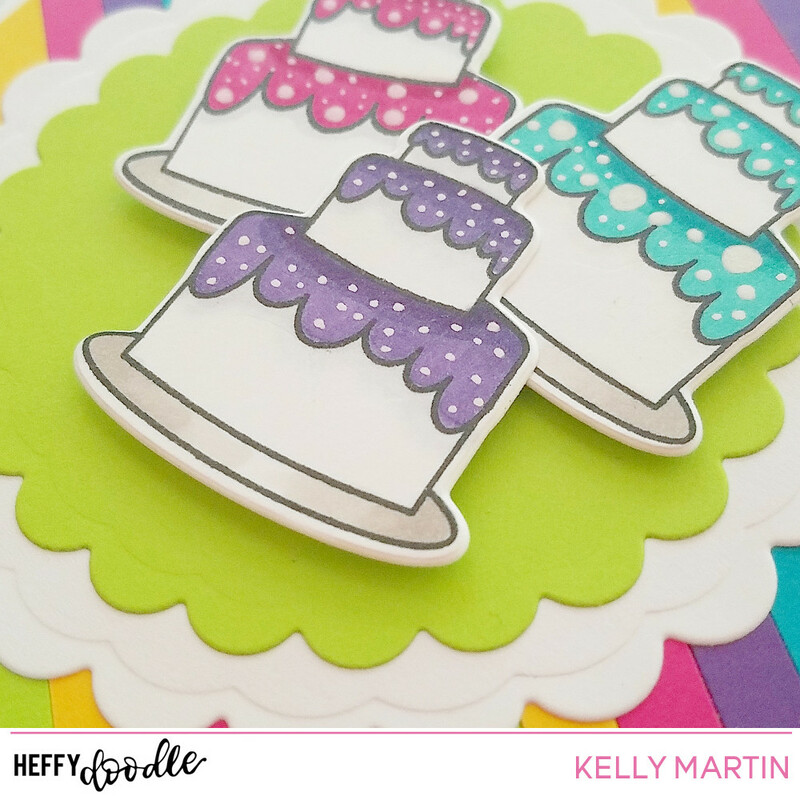 I glued those on to the card panel and then worked on my images.The newest Heffy Doodle release has a fantastic birthday themed stamp set, so I was excited to use it! I stamped them in a copic safe black ink and then colored them in with my copic markers. I used the matching die set to cut them out and then added some fun details with a white gel pen. I used some foam tape to adhere my cake images on to my card panel to give some fun dimension. I then used one of the sentiment stamps from the new release to make my greeting. I trimmed it down and then mounted it on to the card using foam tape as well. To finish off the card, I glued the entire panel on to a cut and scored 4.25 x 5.5 inch card base. Thanks so much for stopping by today, and let's get to the good stuff on the birthday blog hop details! Winners will be announced on June 24th on the Heffy Doodle Blog. If you haven't checked out the newest release, you're really missing out! Find the newest release here. My blog readers can receive 20% off their order by using code: HeffyBirthday2u (Coupon is only available on the Heffy Doodle site from June 13th -June 17th). Thanks again for stopping by and have fun hopping and shopping! Such bright and happy color schemes here! I love the rainbow background . Super cute design and pretty colors! I have a ton (well, almost! lol). Very bright colors - I love it. I love the striped background! Love your color choices on this bright, cheerful card. Thank you!!! That background and your matching cakes are perfect!! LOVE!! Such a pretty birthday day card. Love the cakes. Super cute card. Love that rainbow stripe background. Tfs!! Such fun and fabulous design! I like this colorful birthday card! What a fun card ... love that cake stamp! It looks like a great way to use up some of your scraps, which I have a lot of too. Awww!!! Love your gorgeous card!!! Beautiful colors!!! Such a cute background, and a great way to use up those scraps! Super cute card - love the cakes and the vivid background. WHAT GREAT COLORS! I love the background papers! super coloring and so beautiful cards! Cute card! Love your diagonal striped background. Fabulous birthday card! Love the bright striped background and the fun cakes. How fun and colorful--very clever! So fun!!! LOVE those bright diagonal stripes--perfect way to use up some scraps! How bright and festive! Darling!! Perfect color matching of your scraps in your coloring! I also like all the fun details you added to the cakes. Thanks for sharing with us and for helping celebrate HD's first birthday. I'm really enjoying the hop. Amazing card! So wonderfully vibrant it’s almost electric, so festive. Beautiful card, love your background and everyone wants cake on their birthday. Thank. you for sharing. How fun and cheery the card is! LOVE! What a beautiful card. I love the stripped background. Thanks for sharing with us. What a fun birthday card. I really love stripped background :) Thanks for sharing. I just love it! so inspiring! Great use of scraps! Love the cards. Such a pretty card! I love the bright colours! Love this fun happy card. Thanks for the inspiration. What a great card !! I love the colorful stripes in the background. And the yummy cakes are so cheerful ! This is so bright and fun I love It!